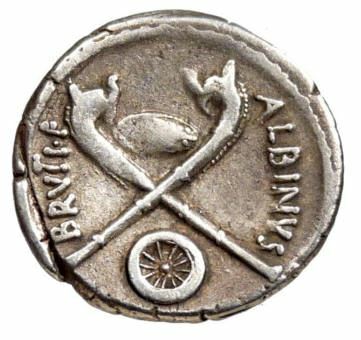 D. Junius Brutus Albinus was a Roman politician and general who struck coins 48 BC, during the civil war. He should not be confused with the more famous Brutus among the conspirators, Marcus Brutus. He served in Caesar's army during the Gallic wars and was given the command of the fleet in 56 BC, and succeeded in destroying the Veneti's fleet. He also served against Vercingetorix in 52 BC. When the Republican Civil War broke out, he sided with his commander, Caesar, and was entrusted once again with fleet operations. When Caesar returned to Rome as dictator, Marcus Brutus joined the conspiracy against Caesar, after being convinced by Cassius and Decimus. On the Ides of March, when Caesar decided not to attend the Senate meeting due to the concerns of his wife, he was persuaded to attend by Decimus Brutus, who escorted him to the senate house, and neatly evaded Mark Antony, who wished to tell Caesar of the assassination plot. When the war turned against him, Decimus Brutus fled Italy, abandoning his legions. He attempted to reach Macedonia but was executed en route by a Gallic chief loyal to Marcus Antonius.